The Fragrance: Modern By Banana Republic | Top Beauty Blog in the Philippines covering Makeup Reviews, Swatches, Skincare and More! Banana Republic is very proud to introduce Modern, a signature fragrance line that reflects the "sophisticated yet easy-going" spirit of today's modern men and women. Modern Woman - Developed by perfumer Jerome Epinette and celebrating Banana Republic's California heritage, Modern Woman is a watery fruity-floral that contains Sun Goddess rose petals - a key ingredient and exclusive Robertet specialty, the brand explains, which delivers a signature floral impression and dries down to soft, white amber. The fragrance opens with notes of Italian bergamot, nymphaea waterlily, blushing golden apple, and white peach; its heart includes Sun Goddess rose petals; White Butterfly cyclamen and Arabian jasmine; and the dry down includes Indonesian patchouli, crystallized musk, powdery white amber and Madagascar vanilla. 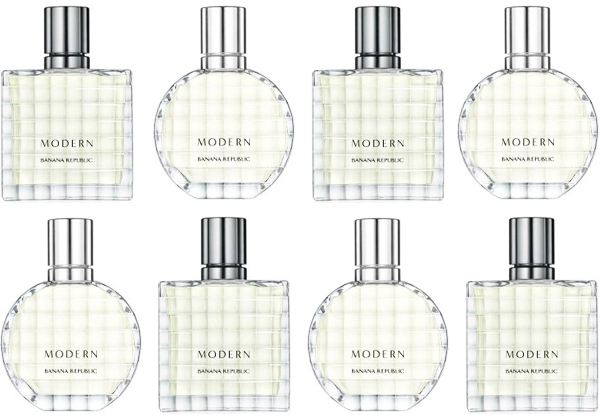 Modern Man - Developed by perfumers Irina Burlakova and Vincent Kuczinski with a juxtaposition of cool and spicy aromatic synergy, Modern Man is a cool, aromatic musk scent that opens with a sparkling watery accord and features the daikon as a signature note, which is a first in fine fragrance, the brand says. The Japanese radish is included to capture a fresh, zesty quality in an unexpected way. This fragrance opens with a sparkling watery Accord, red seaweed, juniper, and grapefruit; mid-notes are Japanese radish, White Cyclamen, and tamarind; finishing with a dry down of Rain Forest patchouli, solar musk, vetiver, white birch, and incense. Both fragrances (50ml) will be available at Banana Republic stores in the US and Canada in October 2014, and in Japan, Russia, United Kingdom, Italy and France by the end of the year. All other international markets will launch in the first half of 2015. I'll have to check these out the next time I'm at BR. I'll definitely try it out! It must smell so good!!! I have to try this perfume! Great packaging! Cool packaging, I would like to try this perfume! The bottles are simply adorable. Great post! Love the bottles. Surely the smell is delicious. Nice fragance and packaging !!! I would like to try them. Nice post! Sounds really nice and the packaging is great! looks and sounds great sweety! Jamás había oído hablar de este perfume, gracias pro el descubrimiento! I really have to try this next time I'm at Banana Republic! Thanks for sharing! Gosh, I'm into fragrance! Gonna check that out, dear! The Gap Company seriously makes amazing fragrances! I fell in love with one from Gap and of course they discontinued it... I should give these a go!